All Box accounts can be used with Google Docs and Google Sheets. You can store and edit new Google Docs directly from Box, and edit other document types, such as Microsoft Word files, with Google Docs via the Box interface. Click New > Google Doc, and name the document. 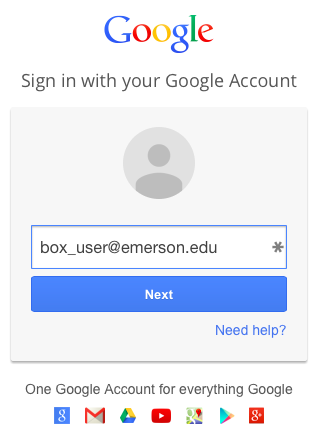 If prompted, sign into Google with your Emerson credentials, and approve Box's access request. Your Google Doc will launch into a separate browser window. If the top right says SIGN IN, simply click the SIGN IN link. Back at your Box account, you'll notice a new *.gdoc file. You can open the document any time by clicking the file name, and then clicking Open. You'll be asked for permission to launch Google Docs (which you can silence forever if you'd like). While you edit your Google Doc, a pen icon will appear in Box to show others that an edit is in progress. If you log into Google Drive while the document is open and being edited, you'll see the Google Doc among all your other documents. 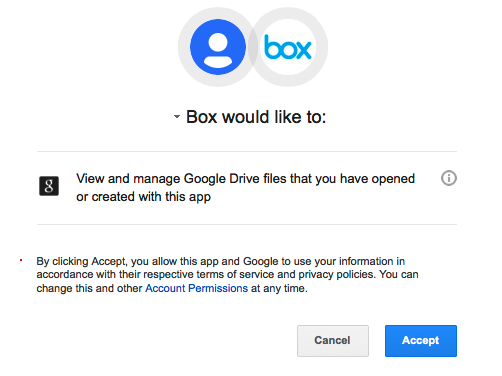 Once you close Google Doc, it will disappear from Google Drive and will only be accessible from Box. Box allows you to use Google Docs as an editor for other document types, like Microsoft Word documents. To open and edit a file like this with Google Docs, right-click on the file in Box, highlight Integrations, then select Edit With Google Docs. When you're done editing, you'll see that the file is still its original type—it won't be converted to a *.gdoc, Google Docs is simply used as an editor.